These influences have shaped the toponyms (placenames) and it is still possible today to retrace the origins of most names of villages and towns. The origins are often seen in the suffixes and this leads us to think that all places with similar suffixes have the same origin. This is often true but not always. Nowadays, most of the place names very strongly influenced by the language region they are located in. Belgium has 3 national languages: Flemish (spoken in the Northern part of Belgium), French (spoken in the Southern part), and German (spoken in the Eastern part). Brussels is considered being bilingual (Flemish and French) but most of the inhabitants speak French. In this articles, we focus on villages and towns containing the sacred word “Saint” (and Dutch and German variation Sint and Sankt), but also other holy places containing holy words such as “Chapelle” (chapel in French), “Eglise” (church in French), “Kapel” (chapel in Flemish), “Kerk” (church in Flemish) and the West Flemish derivative “Kerke“. Each dot represents a place. In Belgium, the dominant religion was (and still is) Christianity. 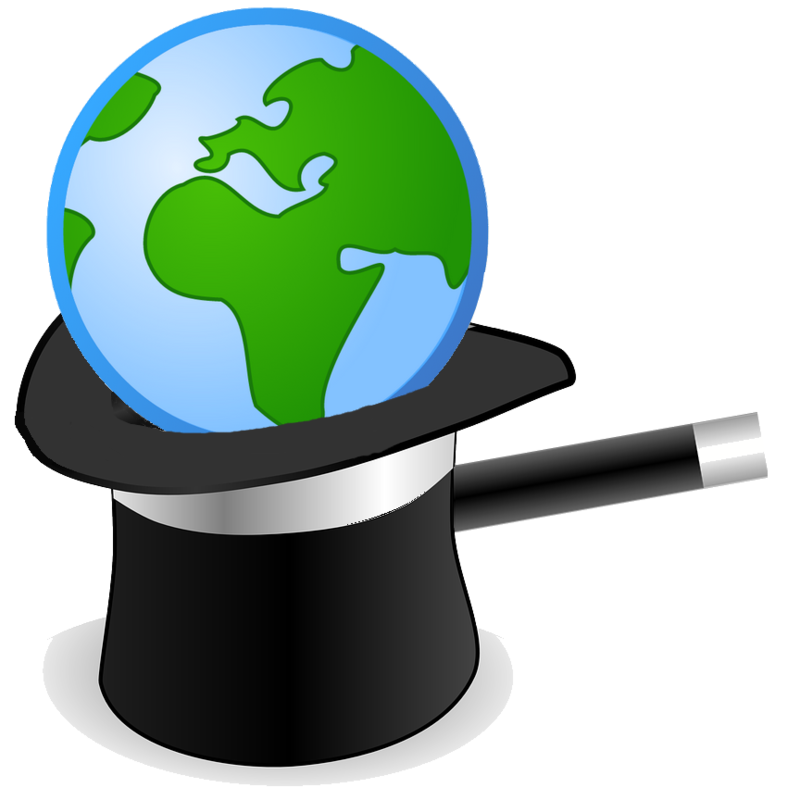 65% of the population adheres to (source: the CIA World Factbook), and this huge religious influence is also visible in place names over time. 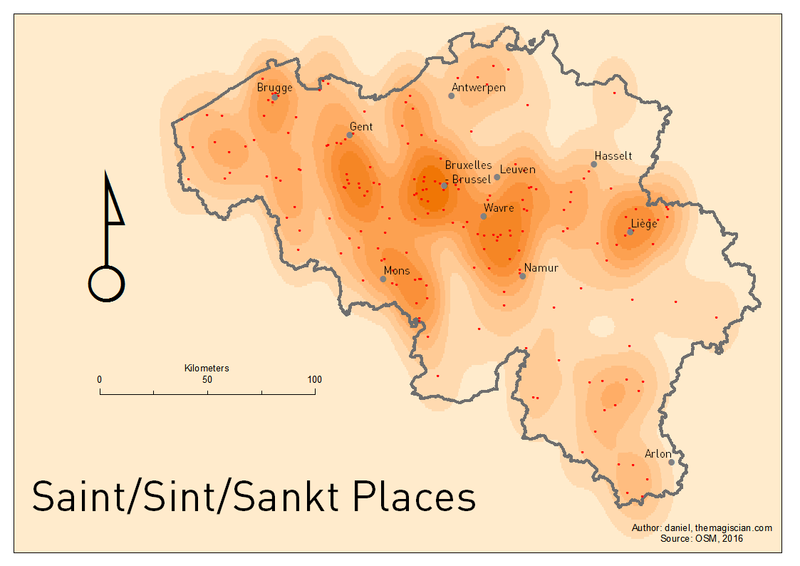 The Villages starting with a “Saint” (in French), “Sint“(in Dutch) or “Sankt” (German) are very common. The places are named after biblical characters that are referenced at these places. The names “Chapel” and “Church” in French and Flemish version are also quite well spread accross the country. 195 places names are sacred in Belgium and they have a good distribution accross the country. Big cities such as Brussels, Wavre, Bruges, Gent, Mons and Liege are well surrounded. There’s however a kind of “no man’s” belt crossing the country from South-West to North-East. Interestingly, only one town in the German speaking part of Belgium contains the “Saint” word: Sankt-Vith (named after Vitus). They all mean “church“. Eglise is the French wor, Kerk and kerke are in Flemish and Kirche obviously is German. 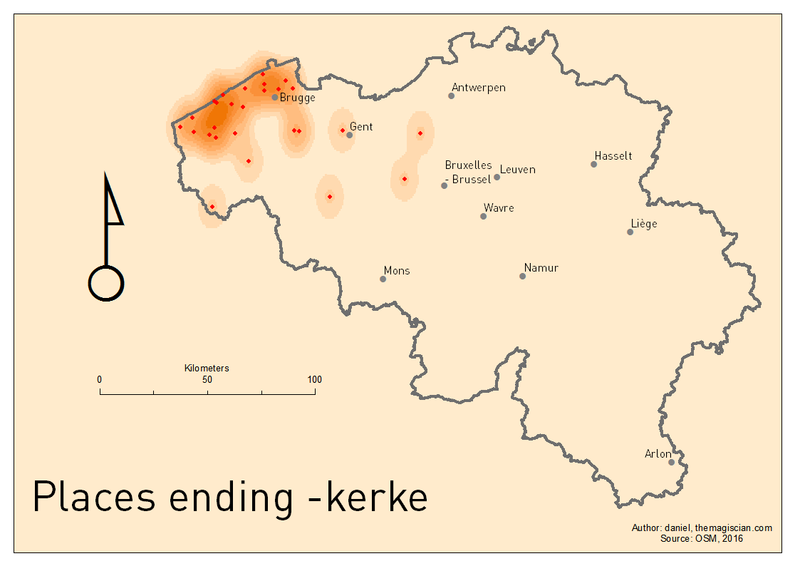 The words Kerk and Kerke are more common in Flanders. These are mainly concentrated at the Belgian coast. As for “kerk”, the “kapel” word is mainly present in West Flanders. 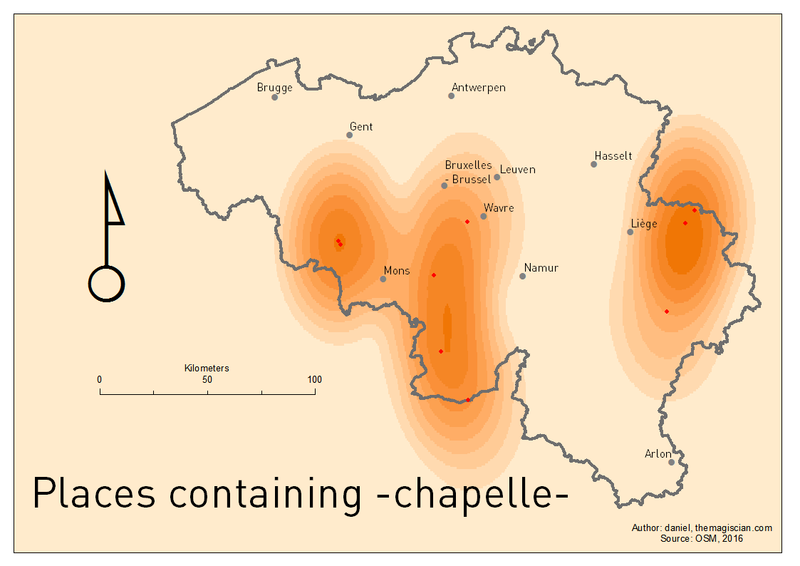 “Chapelle” words are not so very spread accross the French speaking part of the country in the South. 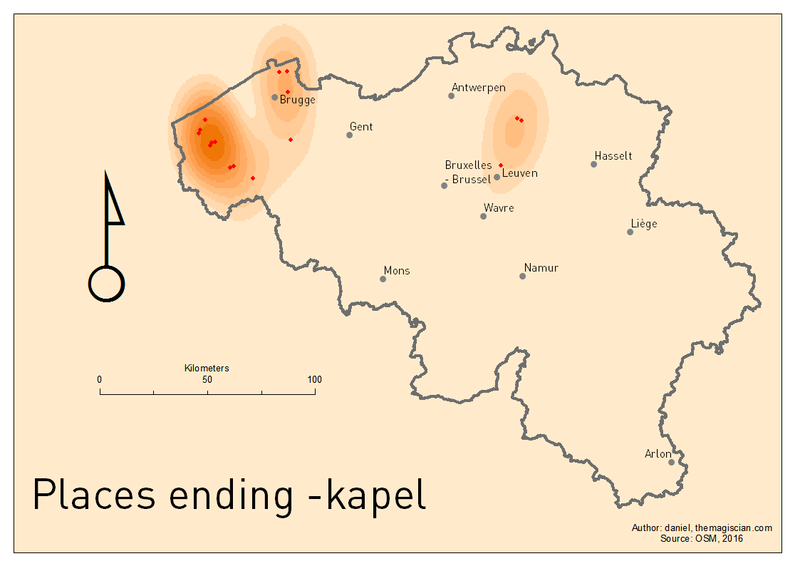 40 villages have either Chapelle or Kapel in their names.